Three dispensaries expect to get final approval from Texas soon to start growing and cultivating marijuana. It’ll take another several months before they can begin distributing the kind of cannabis oil that lawmakers legalized in 2015. In 2015, Gov. 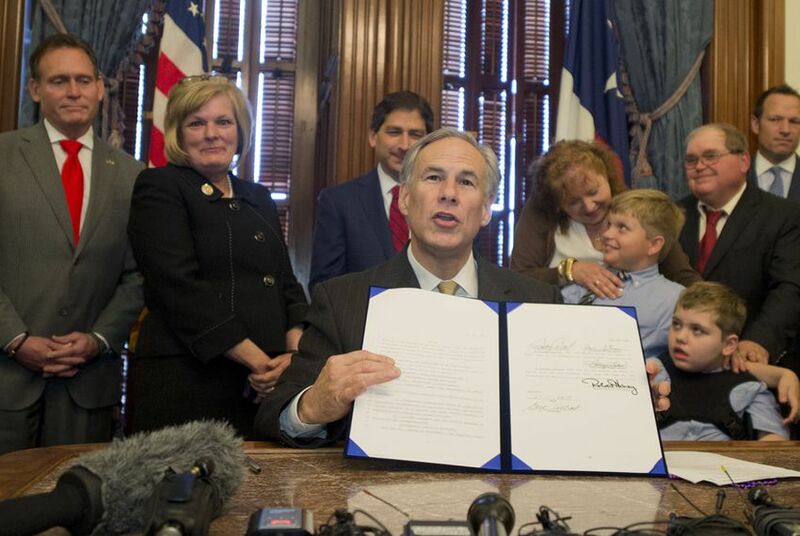 Greg Abbott signed the first bill allowing any growing or sale of marijuana in Texas. The Texas Compassionate Use Act legalized the selling of a specific kind of cannabis oil derived from marijuana plants for a very small group of customers: epilepsy patients whose symptoms have not responded to federally approved medication. Two years later, Texans still can’t legally buy cannabis oil, but a handful of companies believe they are weeks away from receiving the official go-ahead to become the state’s first sellers. But even if those approvals go through, it’ll still be some time before any Texans will be able to buy what they’re selling. The three eligible dispensaries — Surterra Texas, Cansortium Texas and Compassionate Cultivation — are waiting on the final stamp of approval from the Texas Department of Public Safety to begin growing and distributing marijuana. The agency has until Sept. 1 to do so under the 2015 law. That could put cannabis oil on the market by January, two and a half years after Abbott signed a law legalizing it, according to some potential sellers. Dispensaries like Compassionate Cultivation will only be able to sell to a small percentage of Texans under the narrow 2015 law, which allows for the sale of oils with low levels of tetrahydrocannabinol (THC), the psychoactive element in marijuana, and high levels of cannabidiol (CBD), a non-euphoric component known to treat epilepsy and other chronic medical conditions. Supporters have praised the Texas law as a historic shift in the state's policy related to marijuana. But some critics have argued that the THC and CBD levels Texas has legalized are still too low to help many epilepsy patients and provides no help for others who could be helped by medical marijuana in other forms. Twenty-nine states, the District of Columbia, Guam and Puerto Rico now allow for comprehensive public medical marijuana and cannabis programs, according to the National Council of State Legislatures. Texas is one of 17 states to pass a law allowing for the use of "low THC, high CBD" products for medical reasons in limited situations. Texas began accepting applications for dispensing organizations in March 2017. Two months later, DPS announced it had selected three applicants out of the 43 that applied to receive preliminary licenses as dispensing organizations. Denton said his business is waiting to complete a "fairly substantial inspection report" from the DPS before his dispensary will get the approval needed to begin growing and cultivating marijuana. The report is an 18-page document requiring each dispensary to verify the facility’s lease and permits from local fire marshals, among other things, he said. “The inspections will confirm the applicant's’ compliance with the safety, security, cultivation and processing requirements,” a spokesperson for the DPS wrote in an emailed statement to the Tribune. The House sponsor of the Compassionate Use Act, state Rep. Stephanie Klick, R-Fort Worth, said in an interview in the Capitol Wednesday that she expected the first dispensaries would be "up and running" by Sept. 1 and that she's visited with "a few of the vendors." When asked why the dispensaries have not received final approval from the state, Klick said she hadn't heard about that. Advocates, however, said they believe the state’s slow pace for the past two years reflects a larger issue. Emmanuel Garza moved his family last year from Sullivan City, Texas near the border to Colorado, where recreational marijuana is legal, in order to be able to purchase CBD oil and other medical products derived from marijuana to treat his daughter's seizures. He said he pays nearly $200 for a 100-milliliter bottle of CBD oil, which he said lasts almost a year since she takes such a small dosage. Denton said there remain too many variables to know how much his Texas dispensary will charge eligible patients for cannabis oil. “You may have one doctor that prescribes a certain dosing and then another that prescribes a different dosing," Denton said. "[The price] will pivot off of what a price per gram of the CBD oil will be and then how that gets delivered through different products." Shannon Najmabadi contributed reporting to this story.